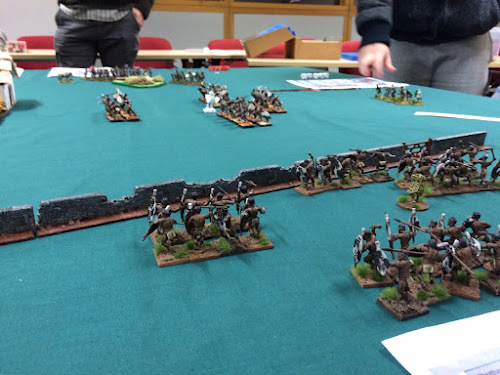 This isn't going to be a battle report, but we played Hail Caesar on Friday night at the club and gave my (as yet unfinished) terrain an outing. When playing games at the club, we're often quite relaxed about painted figures. We only have three hours or so to play on a Friday night and concentrate on having a good game after a full working week. Club nights also provide good opportunities to test new scenarios or new units and the like before playing in tournaments or hosting participation games at various events (like our recent Zulu SAGA game). Dan's Romans are marching on my Celt village. 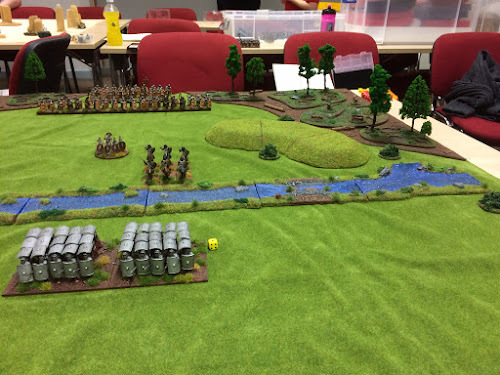 Two heavy Roman infantry units have managed to cross the river and formed into Testudo to withstand missile fire as they slowly move forward... What will the outcome be? Will the rotten Romans burn the village or will the brave barbarians (or hairies, as Dan likes to call them), see off the invasion force? You'll have to wait and find out! We'll play this scenario again once my terrain is fully painted. In the meantime, here's a couple of shots showing the corner woods. 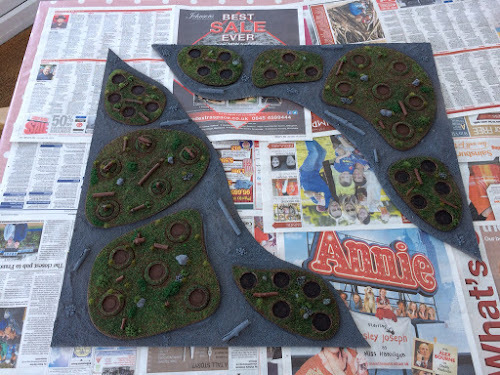 Since we had limited time, we didn't put all of the trees on their bases (hence the open circles visible on most bases). 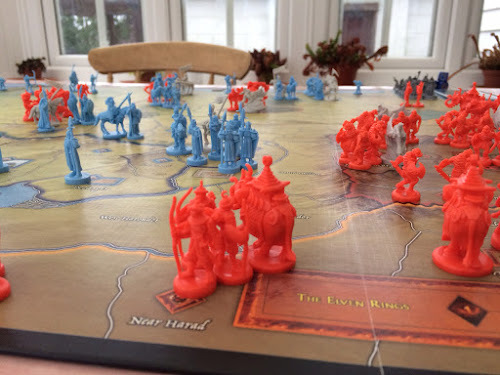 If we decide to take this scenario to a local convention, one issue that did emerge is the problem of trees at the edge of the board getting in the way as players lean over to move figures. This was also an issue I also noticed with the SAGA game at SELWG. In this game I placed a small number of full sized trees at the back of the Monastary as scenery (ie, no terrain effect and could be moved out of the way as required). The trees looked good, but did get knocked over a few times. This is an issue that gets more pronounced with more trees and something I'll keep in mind. For the corner woods, I've already tackled it to some extent by using smaller trees that are individually based. When grouped together they still look like woodland, but their smaller height helps to avoid them getting in the way too much. If any do become a problem, then individual trees can be removed and the holes filled with 'blank' bases on which I have prepared logs, stones etc to match the base. Still waiting to get hold of the AP Leather Brown, so have more time to muse over these things! Managed to make some progress on my terrain projects but became a bit unstuck when I ran out of Army Painter Leather Brown... This is my preferred colour for base coating terrain and I never seem to have enough of it. It's expensive to buy mail order due to courier fees (apparently Royal Mail won't handle aerosol cans anymore). I've put in an order at the local games shop but it may take a week or more to arrive. In the meantime, here's a couple of photos illustrating progress with the corner woodland bases. 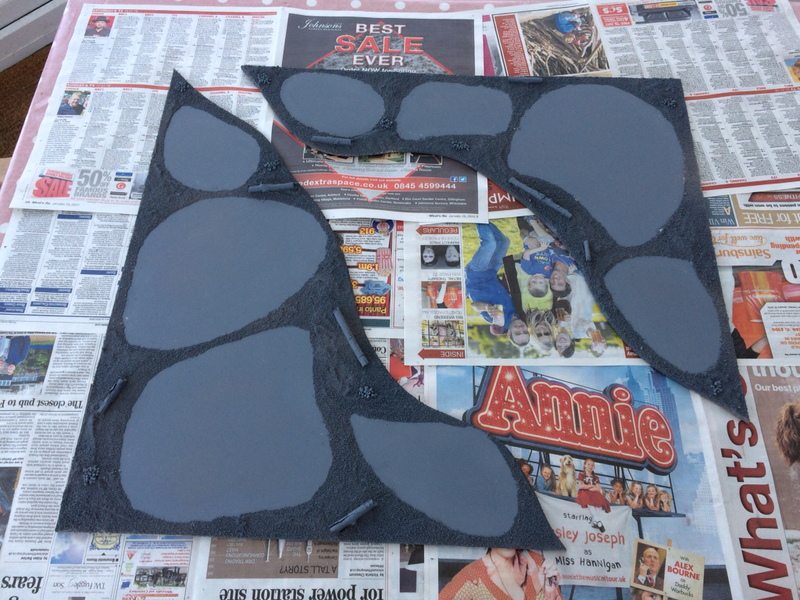 The bases have been sanded and primed. I've attached some small sticks to represent logs and also glued some small stones. Low ground features such as these add interest to the base without preventing placement of movement trays (or individual figures). 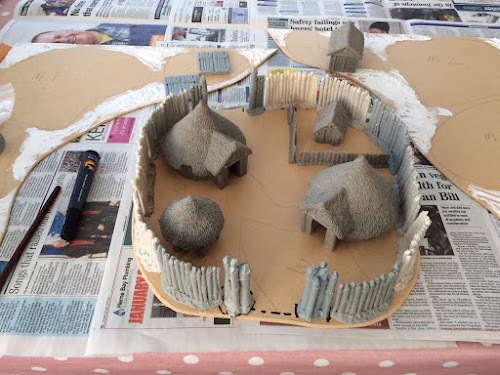 To give an idea of the effect I'm going for, here's a photo illustrating the corner boards with the individual woodland bases placed in position. Time for one of those posts! How did I do in 2015, what did I learn and what mistakes do I plan for 2016...?! Looking back at 2015, it appears a very ambitious target was set! So how did I do? Warhammer figures. Nothing too onerous here. I managed to nab a few figures for some of the classic 80's scenarios. As it turns out many of these figures are quite suitable for both Frost Grave and Dragon Rampant. So I'll certainly continue with this objective in 2016. Ghouls for Mordheim. The ghouls were painted but the Mordheim campaign never happened. Still, the figures are now useful for Frostgrave. Frostgrave is a game I really want to like. As some of last year's posts reveal though, there are some things I'm unsure on. My main gripe is the D20 system, but this is easily overcome by using two D10s. I have all the campaign supplements (including the new Sellsword mini campaign that introduces Captains), so expect the odd battle report during the course of this year. Bolt Action. Here I did stumble. I managed to (more or less) finish assembling my 1500 early war German force. But painting stalled and is something I'll probably come back to this year. 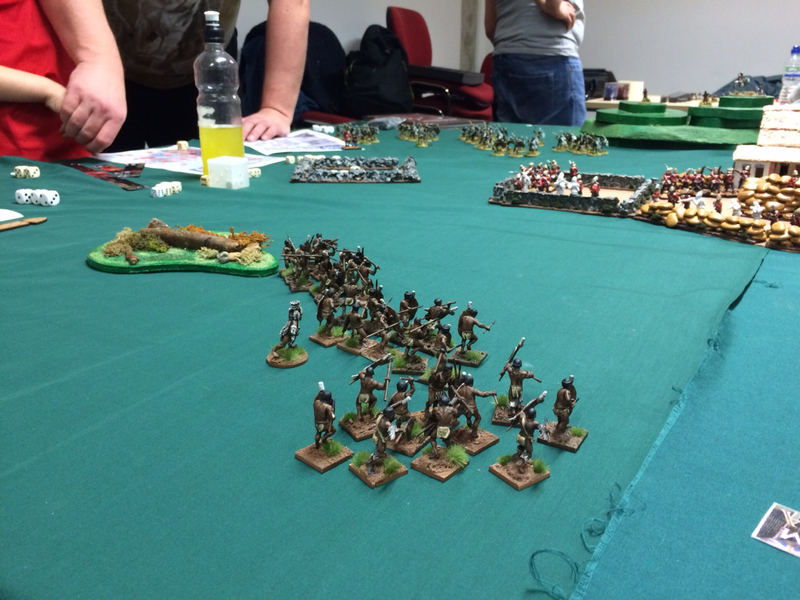 In my defence, I did manage to assemble, base & prime a 1500 British Expeditionary Force. This means I can at least play games at home with Kyle. Tank War. Oh dear! Not a lot of progress here - but see above! Doctor Who. I got into a good stride with Doctor Who early in the year. Figures and terrain were painted. 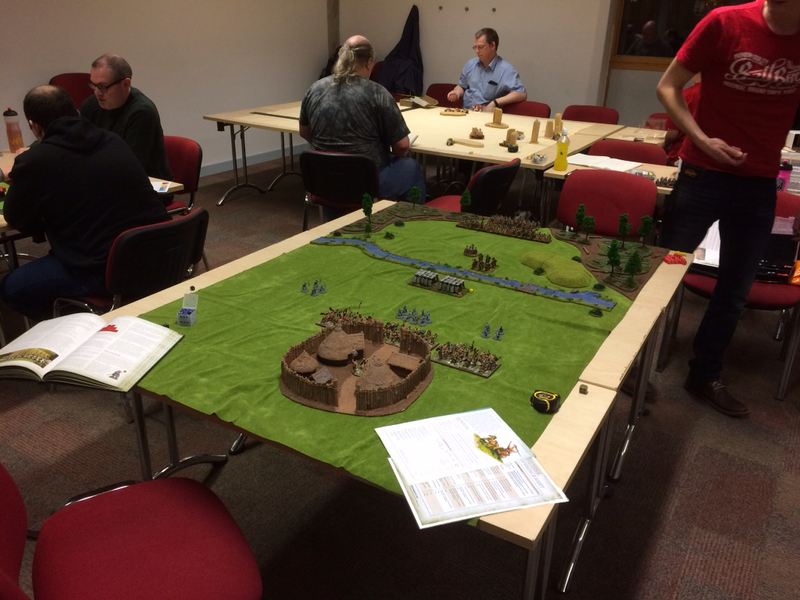 Good progress with painting was achieved for our big Pyramids of Mars campaign, but... Unfortunately things stalled due to waiting for some specific terrain to arrive and becoming caught up with SELWG preparations. Still, I have some DWMG figures back on the painting table, so hopefully there will be more progress on this front soon. In fact, I need only paint 3 figures before we're ready for the first game. However, I'm trying to make sure I plan ahead for all games. My concern is that we start the campaign and stall after the third game because I've not prepared enough in advance. Clearly this will be one of my objectives for 2016. 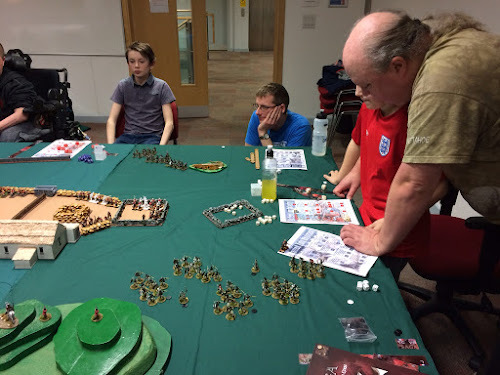 The fact Warlord Games have decided to jump on the bandwagon with their own version of the game should make things interesting later in the year. Gaming events. We did manage to attend most local shows, even running a participation game at SELWG. The participation game was a double edged sword. Guys at the club asked me to do it because I had bought the new Revenant warband for SAGA. Painting figures and scenery for the game completely threw out my schedule though and is probably the main reason I failed to achieve my targets with Bolt Action and DWMG. However, it gave me a target to aim for and meant I painted up a whole Viking Warband and quite a bit of terrain and small scenic items. Of course, it was also a lot of fun actually running the game! The last thing on my 2015 list was my intention to collect and assemble a division of Ancient Britons for Hail Caesar. Ha! I'm ahead of the curve on this one! Through very good fortune I managed to aquire a fully based and painted Ancient Briton division. I also bought enough boxed models for at least two more divisions and have started assembling and undercoating several units. I'm particularly keen on getting some chariots ready for battle so expect some progress updates on this soon. So do I have anything different planned for 2016? 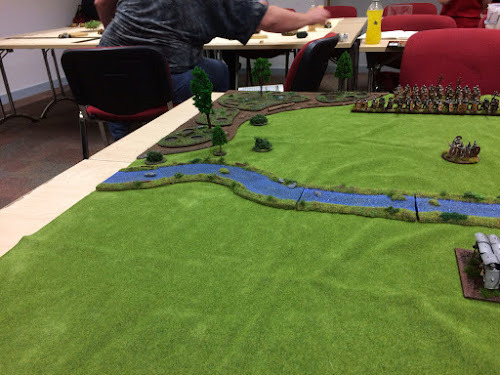 Terrain is an essential element of any wargame - whether it's a custom designed table or a green mat with various bits and pieces scattered across the surface. But striking a balance between realism and functionality can be an issue. Moving small soldiers across a wonderfully intricate landscape can be an exercise in frustration. Figures can slide down hillsides, fall off boulders or simply refuse to stand on rocky ground. More functional terrain enables deployment of troops, but can look a little bland. So what to do? You'll see that there are a number of items of scatter terrain (buildings, marshes, hills etc), that conform to SAGA standards (in terms of area etc). The table was also 'dressed' with a number of purely scenic elements that included items such as burning haystacks, baggage (and a great stonking Viking ship of course!). These scenic elements included a number of bushes and trees that are individually based. These are useful for giving character to large areas of otherwise featureless grassland - but can be easily moved aside if they get in the way of figure placement. But there's something else there as well. The river. The river functions as both a scenery element and terrain piece, but is much larger than most pieces of scatter terrain. I don't just mean that it goes from one side of the table to the other either! The shorelines have depth and help to cover some of the otherwise bland grassland mat. I've decided to adopt a similar approach to other items of terrain - starting with woodland. 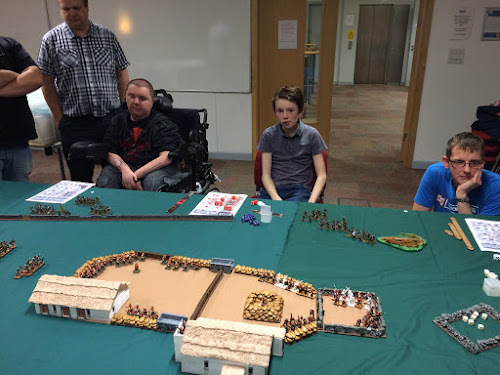 Here's the table from a the game of Frostgrave that I ran last year for Kyle and one of his friends. You can see there are three woodland terrain pieces. Trees are individually based allowing them to be removed from the woodland scatter terrain to permit placement of figures. These small areas of woodland are great for small scale skirmish games, but don't really look very impressive. When grouped together, areas of green mat still show so it's difficult to give the illusion of forest. But creating a huge area of woodland terrain would be a massive undertaking and perhaps not a great use of my limited time, especially since it would only be used for a relatively small number of games. One option is to use a large piece of green felt (or similar) - functional but perhaps a bit uninspiring. My solution is to create a scenic baseboard on which the smaller woodland pieces can be placed. Once assembled this will then give the illusion of a much larger area of forest - but won't actually require any more trees. The baseboard will simply fill in the gaps between the existing scatter terrain. Individual trees or even whole chunks of woodland can then be removed to allow movement of figures. I'm currently putting terrain and figures together for a Hail Caesar scenario published on 1000 Foot General. 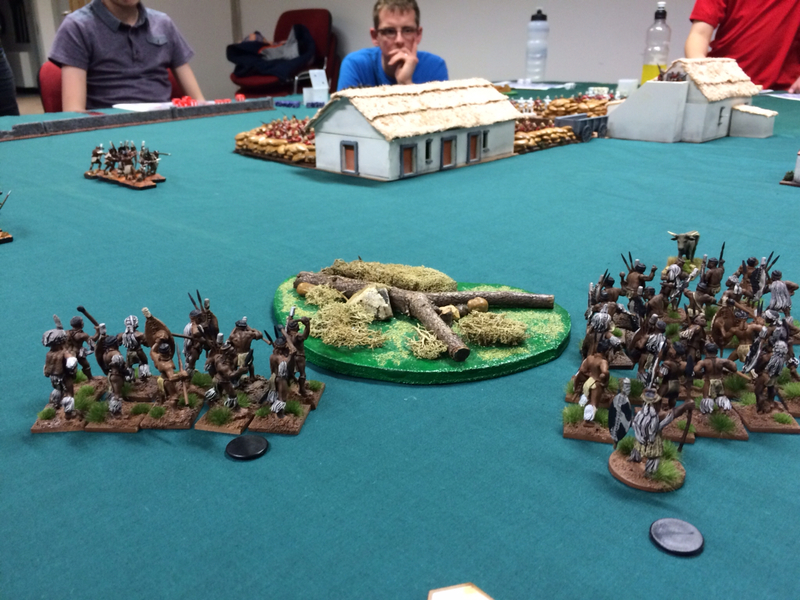 In this game Romans are marching through a forest to attack a Celt village. The forest covers two of the table corners. Each of the individual areas of woodland is marked on the boards. 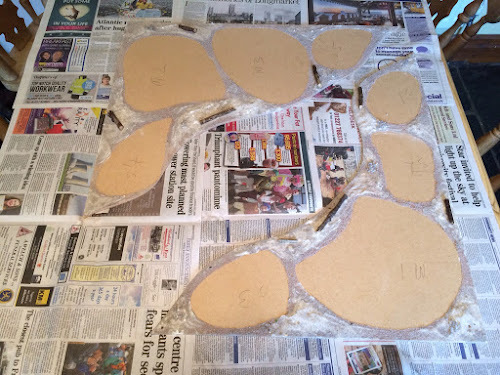 The rest of the board will be sanded, painted and flocked to match. Hopefully, this will allow me to use much larger pieces of terrain with minimal extra effort. The terrain can also be stored easily (since it will be relatively flat, just like the river shorelines). Anyway, this is a work in progress so it remains to be seen how good the finished item will actually look! Friday Night Fire Fight Club will be running a participation game at this year's Cavalier show in February. 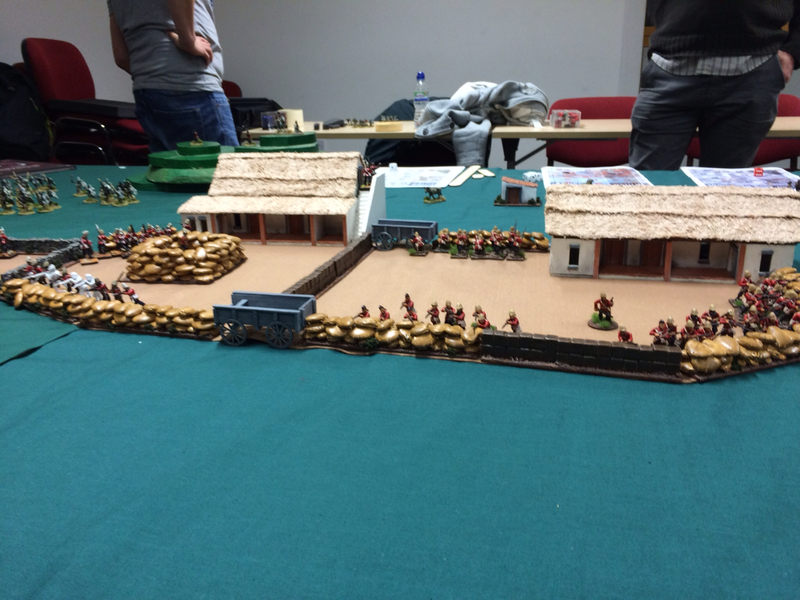 This time it will be Rorke's Drift with home brew SAGA battleboards! We gave the game a go yesterday evening and I kid you not, it was one of the best games of SAGA I've ever played! Paul, Dan and Karl supplied the figures. The Rorke's Drift buildings were scratch built by Dan and battleboards devised by Paul with help from Dan (and a tiny bit of tweaking by yours truly). Six Zulu warbands were set loose on two British Lieutenants and their charges. 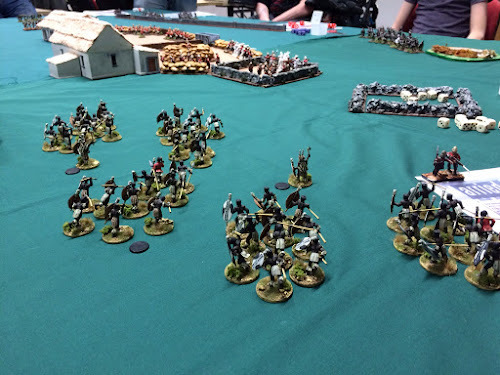 We'll be tweaking the rules a little for Cavalier, but hope to support up to eight participants who will be given their own Zulu warband. There's a few more bits of terrain still to be made, but the game should be a good one! If you are coming along do pop over and say hello! Ok! I knew there was a good game in the box. Had a blast with this over the weekend and now considering the extensions! The soft plastic figures are a bit too bendy for my tastes though and it's unlikely I'll go the extra mile to paint them. Still, they work for the game and the overall quality of components is very good. John Howe's artwork is excellent. Hope everyone had a restful Christmas. Although I play a lot of games at my local club, figure painting and terrain modelling can take up a lot of my limited free time. As 2015 progressed I spent increasing amounts of time painting/modelling and spent less time actually playing games at home with the family. This was exacerbated by the need to get things finished for the SELWG participation game. So over the Christmas period I decided to put painting on hold and get on with some serious gaming. 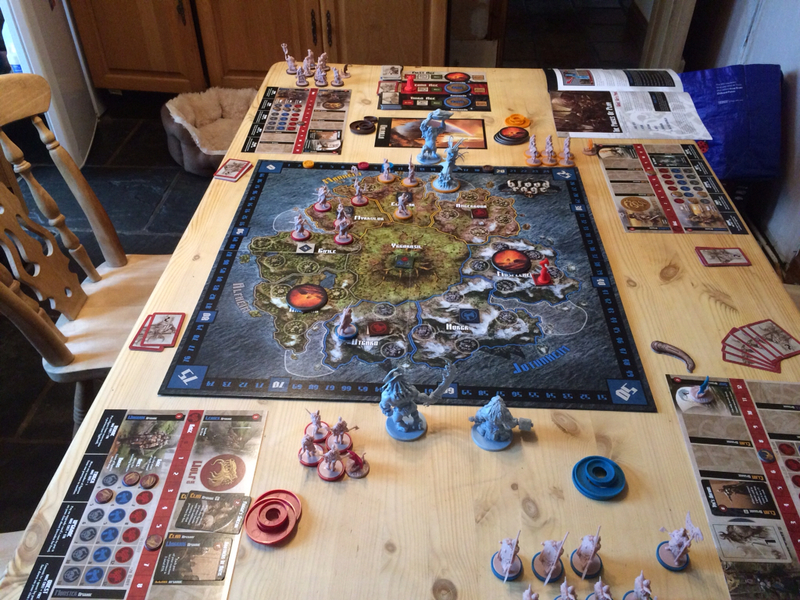 We managed to finally break open Blood Rage and get in a couple of four player games (the family love this game). Other games played included Zombicide (my daughter's new boyfriend joined in with this one...), Forbidden Island, Warhammer Invasion, Sherlock the card game, Salem (another card game), Catan, C&C The Great War and X-Wing. Very nearly managed to get a three way game of SAGA with Kyle and Adam from FNFFC, but unfortunately had to postpone at last minute. My daughter appears to be on a roll and has won the last four of the boardgames we played - including both games of Blood Rage. Hmmm! 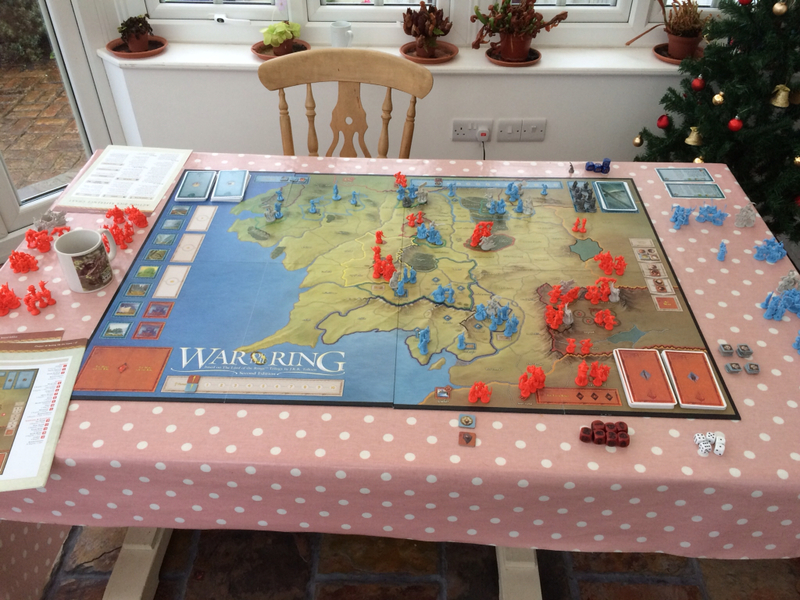 Some time ago we played War of the Ring. This game consistently gets good reviews, but for some reason we didn't get on very well with it. I'm therefore hoping to have another try over the weekend. Gaming starts again at the club next Friday. I'm booked to play Paul at Sword and Spear. This will be our first game with the ruleset and I'll be fielding the Ancient Britons I use in Hail Caesar. Since unit sizes are different I ordered new movement trays from Charlie Foxtrot. Hopefully gluing and painting movement trays will ease me gently back into painting. After all, the lead pile isn't getting any smaller!